Town defender Sonny Bradley is determined to pick up the victory at his former club Plymouth Argyle on Saturday. The 27-year-old centre half spent two seasons at Home Park, making 96 appearances and scoring 11 goals. It will be interesting to see what kind of reception I receive, but when we do arrive there, I’m there to do a job and I’m there to win. He opted against signing a new contract with the Pilgrims in the summer and headed to Kenilworth Road, where he has become a vital cog in the Luton defence. On returning to Devon, Bradley said: “I’m looking forward to going back there, the club are in good form right now and especially at home as well. “It’s going to be a really tough game, but it’s one we’ll be looking to win and that’s all I’ll be focused on to be honest. On what kind of greeting he will be afforded by the home supporters, Bradley said: “I had a good two years at Plymouth and have a lot of respect for the fans still. “It will be interesting to see what kind of reception I receive, but when we do arrive there, I’m there to do a job and I’m there to win. “Whatever reception I receive, I’ll still have a lot of respect for the club either way. It’s the start of a huge week for the Hatters in terms of travelling as after Plymouth, they then head north to Bradford on Tuesday night, the Bantams appointing former Blackpool boss Gary Bowyer as their new manager earlier this week. Boss Mick Harford admitted it might lead to a reshuffle amongst his table-toppers, saying: “We’re going to have to utilise the squad. “We’ve got two long journeys, we’ll travel down there Friday, come back, go to Bradford on the Monday, so maybe a bit of fatigue journey-wise and it’ll be two tough games. 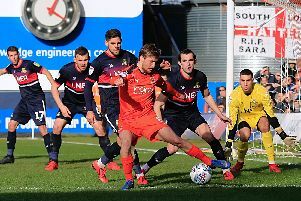 However, striker James Collins won’t be using the two lengthy trips, which will see Luton rack up 850 miles, as any reason for the Hatters to come off the gas in their attempts to win promotion.